For the first sixty-five years of its existence the church had no bells though the tower was designed to recieve them. Through the generosity of Mrs. Laura Millership and Mr J.E. Bennet eight bells (an octave) were purchased in 1977 from All Saints’, Brightside (Also known as All Saints’ Pitsmoor) in Sheffield. There had been a fire at this magnificent church, and it was demolished in 1978; a new Anglican/ Methodist church dedicated to St. Peter was built in 1980. Incidentally, Mrs. Millership had presented St. Anne’s with its church clock in 1956, before the arrival of the bells; this explains why the clock does not strike the hours! The bells arrived at Worksop on 1st June 1977, where they were refurbished by Bernard Hagen, George Thompson and D.L. Parker. Meanwhile, the new bell frame and fittings were being prepared by Taylor’s (bell founders) of Loughborough. They also recast one bell, the third, which had cracked through the heat of the fire. 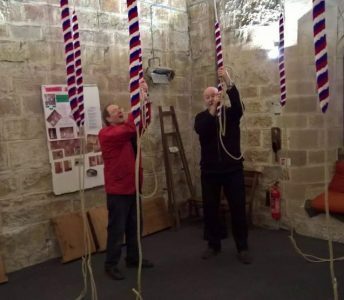 The installation of the eight bells took place during 1980 and 1981 under the guidance of Alan Wilson of Ossington and his son Robert, and a service of dedication by the Archdeacon of Newark was held on 24th October 1981. Two additional treble bells, cast by Taylor’s were added later, in 1984. Apart from running repairs, there have been no alterations since. After thirty-two years, the bell ropes are to be replaced this year.